Client: You. It's all about you! 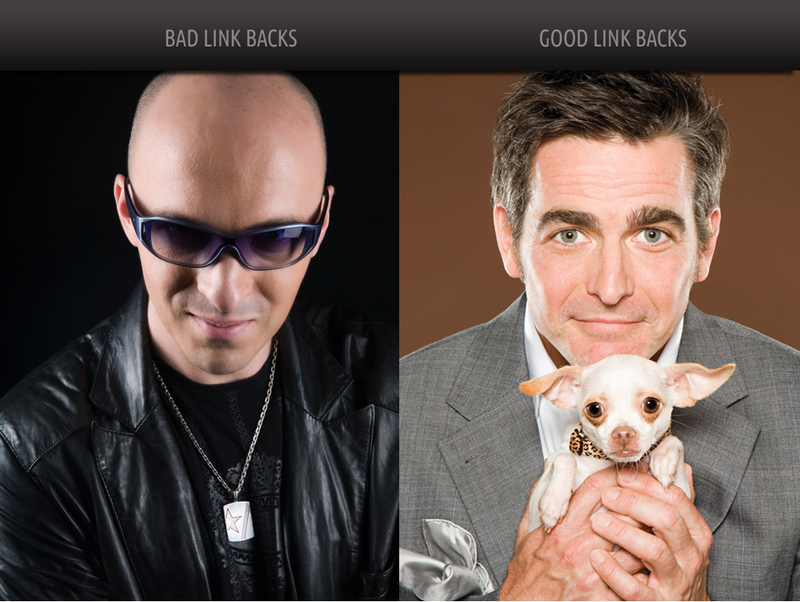 All back links are not created equal. There was a time when folks thought ANY back link was a good back link, and it counted in your favor. After Google's Panda and Hummingbird updates, paid links that weren't "earned" (by having great content on your website) became toxic, and now actually count against your website's ranking on Google. There's a difference between social media back links. If links pointing to your website are from your Facebook and Twitter pages, they're not going to count as high as links pointing to your website from someone else's Facebook and Twitter pages. Facebook or Twitter are given the same credit as any other back link. According to Google, the number of followers you have on Twitter, or Likes on Facebook, doesn't matter in Google's search results (though they certainly might in Facebook or Twitter's universe). Back in the olden days (last year) companies paid for lots of back links to their website – without regard for how credible the websites providing those links were. Most of those link farms, existing only to provide back links, were low-rent sites living on the "wrong side of the track" (so to say). They had a disproportionate amount of links out, not as many links in, not much content, not many pages on the site compared to all the link backs, etc. Since Google knows where every link to your website comes from, those less-than-honorable link farms became targets. They provide links not to quality websites, but to paying websites, so links from link farms became harmful to a site's ranking. So companies had to go back and have those bad links removed: sometimes hundreds of links... sometimes thousands. As with seemingly everything, there are those who try to constantly cheat the system. And it's not nice to cheat Google. (Or Mother Nature.) Google, and really, all search engines, are adamant about serving up great results based on what you're looking for. If they serve up crappy results, you'll just use another search engine. Not good for Google. Guest blogging became big in the last 12 months. it seemed to be the honest way to get back links: you provide good content on another website (ie: ezine), and people will want to share it, and learn more from you by going to your website. But once again, Google believed guest blogging, commenting on forums, and even article marketing was being abused, as well. There are companies trying to sell articles (about your business) for you to post... or take your articles, reformat them, and submit them to lots of other websites for you. You can imagine how quality content could suffer with those arrangements. So once more, from Google's perspective, guest blogging isn't going to work as well as it did before. If you haven't heard the phrase "Content is King," you should read this artcle about it. Content Marketing is all about educating your audience. It's nothing new: you've been doing this forever, whenever you're in front of your customers and prospects. It's just that now, everyone is searching online for information, because they want to be be more educated by the time they talk to you. The question is: how do you rise above the competition to get people to see how you can educate them about your awesome products and services? The answer is Content Marketing. It's not a quick process, but if you're in this for the long haul, this is the way to market your company online. Content Marketing is about being found online. It's about internet marketing. It's about getting in front of your audience before your competitors do.